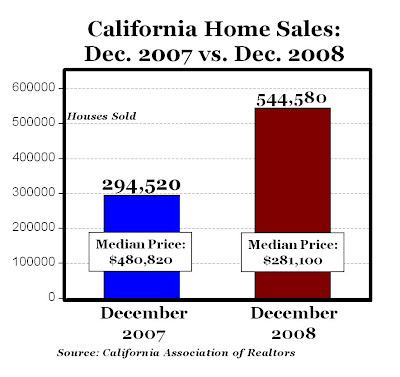 In other words, market forces are working in the California real estate market. Are FHA loans considered market forces? To my mind they are government forces. Government insured FHA loans constituted 40% and 25% of all transactions in SoCal and NorCal in January, 2009. I wonder what the default rate, loss rate and government insurance payouts will be on these loans? The California home market was distorted for nearly 30 years by Proposition 13, encouraging homeowners to stay in their homes longer than they would otherwise due to property tax caps. Now that the bubble has burst and California property property taxes are still going up (because prop taxes had been artificially capped for so long) while home values are falling, homeowners now have good reasons to sell. So California is an outlier and much unlike the rest of the country. Ah-about the previous Prop 13 post- you may not realize that in down markets California law permits home assessments to be lowered. My assessments on my several properties have all been lowered. Artificially capped? Don't let it bother you too much...Californians pay plenty of other taxes....belive it.